Crown molding may be the architectural detail that’s missing in your home. It’s that decorative trim that uplifts a home interior to a more upscale and elegant touch as seen in most classy old houses. While there is plenty of style or size of crown molding to choose from, installing them can take a lot of time, effort, and money. Some homeowners are also afraid to commit to a molding should they have a change of preferences later on and opt for a contemporary look instead. So if you’re still wondering if this is the right style for your home, check out our list of crown molding alternatives below for more ideas. This thin molding is incredibly easy to handle by yourself and you won’t have to worry about having another person on hand to help you work with it. You can easily lift and hold this thinner molding in place by yourself without getting very tired, which will help to speed up the installation process. It is incredibly easy to install this light molding. You can either use very small finishing nails to hold it into place or even opt for the hot glue to install the molding where you want it to be. Instead of worrying about how you are going to cut the corners, when you use a hand miter box you can make the cuts quickly and easily. This will reduce the likelihood that you will make an expensive mistake. It’s easy to put the thinner molding at any distance from the ceiling, which allows you to customize the way that your “crown molding” will look. Because you can paint the wall and thin molding any color you want, you can quickly update the space or change its whole appearance. You can add an additional piece of trim at the ceiling if you want to create a more finished look and one that looks more like crown molding. This material is a lot less expensive than real crown molding is, which is great if you are on a budget and you’re unsure of how you are going to be able to afford to finish your rooms. By painting the molding before installation and the wall after, you don’t have to worry about taping off part of the room or making a mistake. It’s easy to paint over the accent strip at the top of your room without having to try to remove crown molding, which means that you can complete this job on your own without it taking a long time. Paintbrushes are incredibly light and you will be able to complete this job on your own without having to rely on someone to help you lift heavy materials. If you make a mistake you can easily cover it, unlike pulling crown molding off of the wall and then patching any holes that were left behind. Because the paint is very inexpensive, you can update or change your room any time you want, without worrying about breaking the budget. Rather than overpaying for very large crown molding, when you paint an accent strip along the top edge of your room, you can opt for thinner or thicker strips, depending on the overall feel and appearance of the room. This product comes in short lengths so that it is not too heavy or overwhelming for you to work with on your own. This makes it easy to complete a renovation project by yourself. It’s very simple to use. All you have to do is peel off the backing to expose the self-adhered tape and then press it to your wall. You do not need any special equipment to cut this crown molding, as you can easily cut it with scissors to ensure that it is the right size before pressing it onto the wall. Although this is an imitation product, it looks very real and is a fast way to update your home. 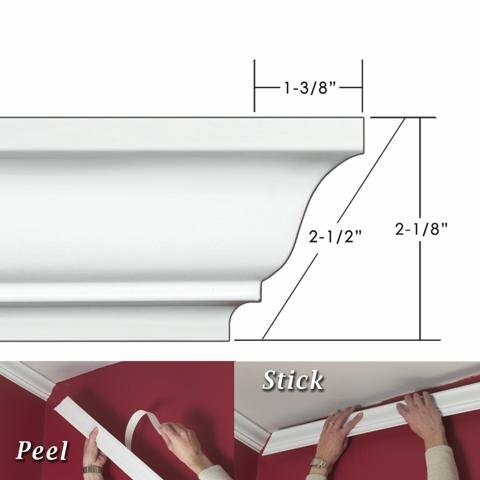 Peel and stick crown molding is a great option for anyone who is on a budget and wants to update their home, but simply doesn’t have the money that is necessary for real crown molding. This can be painted to match the rest of your room so that you don’t need to worry about how it will look. This makes it easy to have the crown molding blend into your room or be a focal point. Perfect to use if you have 90-degree angles in your home, as some of the ends will be pre-cut and you can simply press the molding into place without worrying about using a miter saw. Wallpaper borders take a lot less time to install on your wall than traditional crown molding does. If you have a theme in your home or your room and can find a wallpaper border that matches, then you can tie together the theme and create a cohesive look. This material is very light and can be easy to work with, which means that most people can install wallpaper borders on their own without having to find another person to help them. There are a variety of finishes available, and these wallpaper borders are a great way to add interest to your space without a huge investment. Unlike crown molding, wallpaper border is generally fairly inexpensive. This can be used on both painted walls and walls that have wallpaper installed on them. Medium-density fiberboard (MDF) is another popular alternative to the traditional wooden crown molding. It is installed very much the same way as real crown molding but is cheaper and more lightweight. MDF crown molding is also very customizable, as it can be stained or painted to the color you desire. It also comes in a variety of styles and designs to match your decor. MDF crown molding is available online and at most home hardware stores.